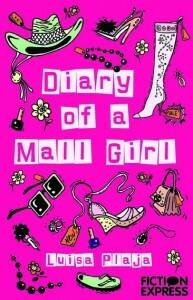 At midday (UK time) on Friday 6th May 2011, the first chapter of Diary of a Mall Girl will go live at Fiction Express, and the fun will begin! You are so lucky!!!! I wish I was you!!! I mean, I know I WILL be you, obviously, as you are me in the future. But do I really have to go through five more years of torture to get there? I want to be you NOW!!! Do you even remember how tragic your life was all those years ago? Of course you don’t – why would you? Well, luckily I’m here to remind you. Dear Future Me: NO. Just no. OK? Read more at Fiction Express. And when you’ve judged for yourself the truly tragic nature of Molly’s predicament, please vote for what she should do next. Because… believe me. Molly needs your help! Good luck Luisa. I shall leave tab open on my PC at Fiction Express so I can read it at 12noon. Thank you so much for your support, Vivienne! yay! Can’t wait! Ooh just noticed the time has come!